In response to requests, I am making my kaleidoscape templates (featured in my blog posts Kaleidoscope Botanicals and More Kaleidoscope Botanicals) available for download. To keep the downloads reasonable, I have prepared a set of low-resolution templates for 4, 6, 8, 10, 12, and 16 reflections. Because of the way the templates work, it is possible to scale them easily with the ultimate resolution being determined only by the image you are using for the kaleidoscape. To download them in a single 25 MB zip file click here. These templates are free and may be used without restriction. If you share them, please include a link back to my website. Also, acknowledgements in the form of a link to my website are always appreciated. Open a template in Photoshop. Select Image>Image Size… and scale the template to the desired size and resolution. Open the image that you want to use for your kaleidoscape. In the image file, copy the image using Select>All (Command-A or Control-A) and Edit>Copy (Command-C or Control-C). In the template file, double click one of the Smart Object Layers to open it. Command-Click (PC: Control-Click) on the bottom thumbnail in the Layers palette to select the wedge shape. Make sure that the upper layer in the Smart Object is activated and select Edit>Paste Special>Paste Into to add the image to the Smart Object. The image should be visible in the top layer in the Smart Object. Select Edit>Free Transform (Command-T or Control-T) to scale and position the image within the wedge the way you want it. If gray patches show in the wedge, you may be able to eliminate them using Content Aware Fill. Close and save the Smart Object and wait for the magic. If lines appear along the seams of the wedges, create a merged layer at the top of the stack (Command-Option-Shift-E or Control-Alt-Shift-E) and use the spot healing brush in content-aware mode to eliminate them. Just click on one end of the line and Shift-Click on the other end. Experiment with different subjects, numbers of reflections, positioning, etc. Most importantly – have fun! 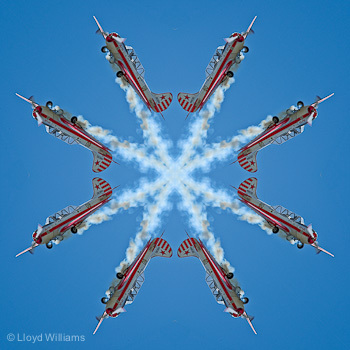 If you create images that you would like to share, please send me a link (lloyd@lloydwphoto.com).